This is a new edition of a best-selling book which was recommended by the BBC video "Accounting for the Terrified". It is a cash-book to write in all your business takings, bankings and expenses for one year, thus helping you to complete your annual UK tax return. The book has a weekly layout and there are simple instructions to help you put your figures in the right boxes. At the back of the book, essential end-of-year tasks are also explained. This "Yellow Version" is for non-VAT registered small businesses, and is ideal for: the Self-Employed, Beauticians, Cafes, Chiropodists, Cleaning Services, Driving Instructors, Garden Services, Guest Houses, Hairdressers, Market Traders, Painters & Decorators, Shops, Taxi Drivers and most similar businesses. 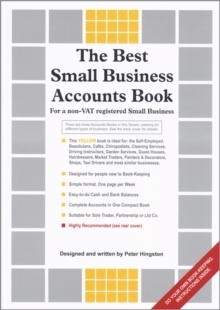 The book includes instructions for people who may be new to book-keeping, but it is not a manual on accounting or tax. Note there is also a monthly layout version for non-VAT small businesses with mostly invoiced sales - this is the "Blue Version".